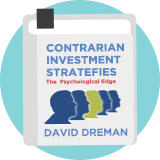 David Dreman High Dividends is a contrarian high yield strategy championed by the renowned US fund manager and author David Dreman in his book Contrarian Investment Strategies. Dreman favoured buying out of favour value stocks with straightforward filters for quality. In this version of the screen we filter for higher yielding shares with strong financial positions, as many favourable operating and financial ratios as possible, with above average earnings growth. Dreman explains: "High yielding stocks provide you with the best protection in a bear market. These stocks give the dividend oriented investor more protection of principal on the downside and provide both rising dividend income as well as capital appreciation." Dreman's studies showed that the highest quintile of dividend paying stocks in the market outperformed those with low or no dividends by 4% annually, with half of the returns coming from the dividends themselves. He cautioned that "buying stocks with high dividend yields beats the market, but provides lower total returns than his other contrarian strategies". Dreman runs the firm Dreman Value Management and continues to research and write on contrarian and behavioural investing.